There’s a tree you often find in parts of the eastern United States and Canada, with heart-shaped leaves that turn red and orange and golden yellow with the coming of autumn. I always smile when I walk by this tree. Streams of the little hearts drip down its branches, a waterfall of color welcoming us to the season. What’s even more enchanting for me, though, is that stray leaf which drifts off the tree. You know the one. It’s camouflaged by the grass or else lying on the pavement, quite unassuming, its face a little freckled and its edges curling in gently. In essence, however, it remains as it ever was—a heart. There are many narratives one could read into this phenomenon at once ordinary and extraordinary. It could be a story of existence beyond time, of that which both respects and transcends the dictates of the elements, the undying spirit of a certain something that gives true meaning to this life. It could also—relatedly—be a story of grace, how it envelops everything, how it can be found in even the most seemingly unexpected of places. This is Baba’s month, October. It is the time when we observe the anniversary of Baba’s mahasamadhi, his passing from the physical form to merge completely with that great, expansive Consciousness pulsing in each plant and creature and inanimate particle of this universe. Baba took mahasamadhi on the full-moon night of October 2, 1982. This year, the lunar anniversary of Baba’s mahasamadhi is on October 24. It has become a tradition for students on the Siddha Yoga path to take note of the many reminders of grace—Baba’s grace—that we find around us at this time. “Baba signs” they are called. Perceiving these signs, picking up on these synchronicities, we feel that Baba is with us. We know he is here. And we can do something with that feeling—this is what is perhaps most important. If we so choose, we can take the signs we see as encouragement for our sadhana, reminders to keep practicing the Guru’s teachings, knowing that our efforts to achieve the goal are supported inestimably. When we do so, moreover—when we take such action—something amazing happens. Our perception of grace expands and transforms. Gurumayi has spoken many times about how Baba loved to teach about the Blue Pearl—the nila-bindu, the sublime goal of sadhana, the entirety of the cosmos and our oneness with it encapsulated in one sesame-seed-sized point of blue light. Gurumayi has said that the Blue Pearl was Baba’s dearest experience. It is a beautiful image to hold in our awareness and to contemplate, particularly in this year when Gurumayi’s Message is Satsang, the company of the Truth. To see the Blue Pearl in meditation, in our dreams, in our waking state is to have the experience of satsang. It is to be in connection with our true Self, and to recognize this same Self in all that is around us. It is to understand, not just intellectually but instinctively, intuitively—in our bones and our tissue and that place where our soul just might reside—the meaning of Baba’s teaching, "See God in each other." I’ve always loved to read and listen to Baba’s descriptions of how he saw the world. Baba said that the Blue Pearl was what he would first see when someone came before him; everything and everyone was made of shimmering blue light. Just thinking about this vision inspires awe. Just conceiving of the fact that such a vision exists—and that it is the true reality of this world—gives rise to wonder, astonishment, gratitude. It is the vision of the saints, the reality they invite us into. These questions are posed by the great sage Adi Shankaracharya in the Bhaja Govindam, a Sanskrit-language text which is based in Vedantic philosophy, and which has been sung in Siddha Yoga Ashrams. In her Message talk for this year, Gurumayi spoke about Adi Shankaracharya; he was one of the saints who, centuries ago in India, first brought people together in gatherings of satsang. The questions that we see here from Adi Shankaracharya are ones that the saints and sages have asked since time immemorial. They were pertinent in ages past and they resonate now, for they articulate a yearning so deep, so innate, it is definitive of human existence. People throughout history have explored these questions in varied ways, their pursuit often resulting in expressions of incredible creativity and very tangible actions to foster peace and goodwill. On the Siddha Yoga path, we are fortunate beyond measure, for we are guided by the Guru’s grace and teachings in this most fundamental journey of purpose and identity. Who am I?—this endlessly rich, profound inquiry—is the title that Gurumayi has given to this year’s Siddha Yoga Shaktipat Intensive in Honor of Baba Muktananda’s Mahasamadhi. It is hard to overstate the significance of the Shaktipat Intensive. It is during the Intensive that the Guru bestows shaktipat diksha, divine initiation, the awakening which commences our sadhana on the spiritual path. Baba created the Shaktipat Intensive forty-four years ago, in 1974. Since then, Baba and Gurumayi have held hundreds of Intensives, giving shaktipat to countless thousands of people. This year’s Shaktipat Intensive will be held around the world on Saturday, October 27, or Sunday, October 28. For more information, including a Q&A with Swami Shantananda, I invite you to read through these pages. In addition to participating in the Shaktipat Intensive, you can celebrate Baba’s month through the Siddha Yoga path website. Beginning in mid-October the website will feature the annual photo gallery of Baba’s moon as it waxes toward fullness; you can contribute to this gallery by sending in your own photos. There will also be a video of Baba speaking about the Intensive, teachings by Baba, a darshan gallery of his image, and an exposition about turning the senses within. Since October is the month of Navaratri as well—the nine-night holiday honoring the Devi, Mahakundalini Shakti, whose power is awakened in us through shaktipat diksha—there will be teachings, hymns, and namasankirtana to support us in worshiping some of the Devi’s various forms. This year, Navaratri takes place between October 9 and 17. So it is, all in all, a special time. A sacred time. A time when grace, with its mysterious and enthralling power to prompt real transformation, feels so viscerally present—and when our own responsibility to allow for that grace to unfold, for the betterment of ourselves and our world, can seem all the more immediate. In Shree Muktananda Ashram, we received a sweet reminder of this—grace and effort and their combined impact—in the days leading up to October. Summer was bidding us farewell; the trees were beginning to turn color. And yet—sunflowers started popping up in all parts of the Ashram gardens and grounds! They’d sprout up for a short while, right before the cooler air set in, and often far from the garden patch in which most other sunflowers were planted. It was as though Surya Devata had been walking about and we’d just missed him, the flowers leaving a vibrant trail of where his lotus feet had been. I later learned that these surprise sunflowers had been planted by chipmunks on the Ashram grounds. Yes—chipmunks. They had collected seeds from the sunflower patch and from birdfeeders that are in the garden. And then, like the dutiful new garden sevites they are, they strewed those seeds about, bringing light and warmth to all parts of the grounds—and to all who walked by. 1Bhaja Govindam, verse 12, in The Nectar of Chanting (S. Fallsburg, NY: SYDA Foundation, 1984), p. 189. Eesha was introduced to the Siddha Yoga path by her parents in 1991. She has been serving on staff in the SYDA Foundation since 2014 and currently offers seva in the Premotsava Department. Between 2011 and 2014, Eesha served as a visiting sevite in Shree Muktananda Ashram in the Content and the Food Services departments. 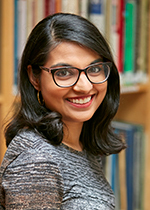 Eesha earned a Bachelor of Arts degree from the University of Pennsylvania, where she studied creative writing and communications. Before she began serving on staff, she worked as a writer for various organizations and publications, including an international food and travel magazine. I have been contemplating the title of the upcoming Shaktipat Intensive Who Am I, and feeling a deep shift in my consciousness: letting go of feelings of unworthiness and truly embracing my identity as the divine Self. Yet something else has been happening too. I’ve come to recognize the divine perfection of my human life, my unique human person, and my own journey to inner freedom. It’s as if a deep passageway in my heart is opening, and I feel the divine origin from which emerges my human expression. It is an embrace of myself. It is love. It is my Guru's love. It’s so sweet to read the letter for October, Baba’s month, and the reference to "Baba signs." It brings to mind my favorite sign of Baba: the resplendent red cardinal. This bird with its tufted head feathers, black-rimmed eyes, and bright red body reflects what I consider to be some of Baba’s iconic aspects: his ski hat, his kohl-lined eyes, and his red robe. Even the call of the cardinal reminds me of Baba’s evocative voice. And whenever this bird of solitary habits shows up during Baba's month, it's another sign for me that Baba is near. Just a few hours before I read this letter, I had a vision of the Blue Pearl in my morning meditation. I merged into the Blue Pearl, heard the divine sound of chimes, then dissolved into silvery-golden light. When I later read in the letter that the Blue Pearl was Baba’s favorite subject, I knew this sublime experience had been a synchronous experience of grace. I thank Baba and Gurumayi for these signs of divine grace and blessings. As I was reading the October letter again this morning, I fell into a kind of reverie where I began to witness a scene from a recent dream. I immediately noticed that my conscious awareness was present within each of the characters in the scene, experiencing each one’s thoughts and emotions as my own. I thought, “Oh, the same conscious Self dwells within all!” It wasn’t really a thought; it was a recognition. So simple, so natural, so obvious somehow. I felt this was a flash of pure awareness arising from within about the title of the Siddha Yoga Shaktipat Intensive, “Who am I?” As Baba’s month of October unfolds and the Shaktipat Intensive draws closer, I feel I am circling around and drawing ever nearer to this luminous and time-honored question at the center of my sadhana: Who am I? I decided I would read the October letter on the second day of October, to read it precisely on the solar anniversary of Baba’s mahasamadhi. On the morning of October 2, I saw many clouds in the sky, and three of them appeared clearly to me as the three lines of sacred ash we see on Baba’s forehead in many photographs. I smiled and thought, this is a sign of Baba’s presence! When I read the October letter, I was certain this experience was Baba’s salutation on this day. Inspired by the October letter, I decided that each day this month I would watch for "Baba signs." I recalled some of those signs that were familiar to me: red socks, peacock feathers, roses—and Baba’s radiant smile. The next morning, as I rose early for a walk with my dog, my quest for Baba signs began. I didn’t have to wait long! Turning the key in my car, the CD I'd been playing resumed, and the chant Om Namo Bhagavate Muktanandaya filled the air. Baba’s name—a powerful sign. During my walk, I spied a cobalt blue feather on the ground—just the color I associate with the Blue Pearl. Another magnificent Baba sign! With each sign, pure joy flashed forth; I experienced satsang, the company of the Truth, within myself. Like a gleeful child on a treasure hunt, I am now wondering, "How many Baba signs will I see this month?" As I read the letter, I realized that I was entering into a very special and sacred time. I am inspired to prepare myself more deeply for the Siddha Yoga Shaktipat Intensive by reflecting on and pondering its title. I am reminded of my own shaktipat experience, my yearning to experience the Blue Pearl in meditation, and my responsibility to nurture the awakened power and consciously allow it to unfold in my life here and now. Thank you, Gurumayi, for guiding us and offering us the magnificent facets of satsang to explore in this month. After reading about "Baba signs” in the monthly letter, I glanced up at the sky and saw three strong, horizontal white lines against the blue, made from clouds and an airplane trail. I knew immediately this was a “sign” for me, a reminder of the grace I had received on this wonderful path. I thought of the three Siddha Yoga Gurus, and I thought of the bhasma, the sacred ash drawn across the forehead. This remembrance took me back to an extraordinary dream I had around the time I received shaktipat initiation in October, 1990. The dream culminated in Gurumayi’s placing her hands in a pot of sacred ash and drawing this bhasma across my forehead. As she did so, my entire being exploded into light. I have never forgotten the power of this dream. As I recalled it today, I was filled with gratitude for the immense gift of shaktipat and all that has unfolded since, and I felt great love arising from within. As I sat in stillness and quietude and read this profound letter, it felt as though I was sitting in Gurudev Siddha Peeth with Baba giving darshan. His animation as he spoke always brought great joy to my heart. The lilt in his voice, his description of God, and his wonderful stories brought me into the realm of Truth. The unconditional love I felt at these times was felt in the very center of my being. October for me is always a great satsang. It was grace I felt when I received spiritual initiation, and it is absolute love I feel now. Thank you, Baba, thank you, Gurumayi, for making my life full of meaning. I loved the powerful reminder in this letter to keep pausing, to keep connecting, so that we can begin to satisfy more and more our genuine longing to know, to understand, and to answer our soul’s deepest question: "Who am I?" As the time of the Shaktipat Intensive approaches, this question resonates more and more inside of me. As I "pause to connect," and to ask this question again and again, I begin to perceive my own love in everything around me. I feel it as I look into the eyes of my two cats, as I walk down the path through the woods and commune with the pine and juniper trees, and as I greet fellow walkers in the forest. Everything and everyone seems to reflect back to me, in a living mirror, the Consciousness that is in me–that is me. My heart feels drenched with love as I rest in the awareness of the living Consciousness I experience throughout my whole being and the beautiful world around me. This letter made me feel wholly welcomed to the month of October, the month of the Siddha Yoga Shaktipat Intensive in Honor of Baba Muktananda’s Mahasamadhi! Although I never met Baba in the physical world, my parents met Baba before I was born, and I feel that Baba has been with me my whole life. I smiled while reading this letter, imagining the crimson, heart-shaped leaves and the late-summer sunflowers planted by the chipmunks. These images remind me of the tangible ways I experience reminders of Baba’s presence in my life—often in nature. After reading this letter, I am filled with enthusiasm for the opportunity to immerse myself in the Siddha Yoga teachings this month. I am inspired to set aside time each day to be with the posts on the website, in preparation for the culminating event of the month—the Siddha Yoga Shaktipat Intensive! When I read the October letter, I could visualize each image that the writer described. And when it came to reading about Baba's Blue Pearl experiences, my attention was drawn to my heart, which immediately expanded and became light. My focus moved from my intellect to my heart and I experienced the true meaning of the word comprehend: understanding from the heart. Although I have not seen the Blue Pearl, Baba's grace has shown me where my soul truly resides. Thank you, Baba, for your timeless grace. Thank you, Gurumayi, for the gift of these monthly letters. As I read and reread this month’s beautiful letter, I noticed that woven throughout the letter, like a recurring motif, are instances and reminders of grace—Baba’s grace, Gurumayi’s grace, nature’s grace—that omnipresent grace that protects and propels, supports and nourishes my life. The letter also highlights the gift I can offer to myself by participating in the Siddha Yoga Shaktipat Intensive in October. I can already picture myself seated in the Siddha Yoga Universal Hall, immersed in the shakti, waiting eagerly for the Intensive to begin—on the verge of a day of immense grace that will stay with me forever. What a grace-filled month ahead!